The first sign that termites have invaded your Brisbane-area home, flying termites usually make their presence known in spring and summer. You can avoid putting out the welcome mat this year by preparing for their arrival with a treatment and prevention program that will keep them from landing on your front door—or inside your home. With early preparation and treatment during the late winter and early spring, you will have fewer unwanted house guests this spring and summer. First of all, you need to learn whether what you’re seeing are actually termites, or if they are ants. Both types of insects swarm in the springtime, and both sprout wings during swarming season. Although they resemble each other in colour, size, and their general shape, there are indeed differences. Look at the wings. Flying termites have four wings of equal size, whereas flying ants’ top wings are about twice the size of their bottom ones. Next, look at the antennae. Ants’ antennae are bent—almost at right angles, compared to termites’ antennae, which are straight, with only a tiny bend at the very end. An ant’s colour, too, will be darker than that of a flying termite. A termite will be a light golden or even beige colour. A termite’s body only has two visible parts, compared to that of an ant, whose body is divided into three easy-to-see segments. In general, termites are a bit longer and slimmer overall than an ant. Although flying termites won’t bite you, they will take a bite out of your home or business building. The longer you ignore the problem, the more of your home they’ll eat away. Flying termites are indeed bad. Here’s why. Because they live underground, termites build their colonies near your property in hopes of invading it for food. They can hide for years on end—but one sign gives their presence away—wings. 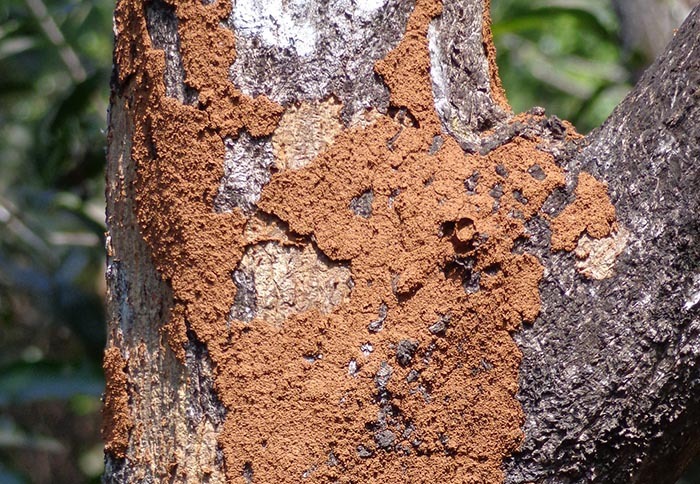 As spring approaches, the humidity rises, creating the ideal environment for moisture-loving termites. During that time, they begin to swarm in search of a mate, since they are in little danger of drying out. Their goal—to move further on, raise a ‘family’, and create more colonies. Wings help these flying termites, called alates by scientists and pest control professionals, get further away from their original colony. Because there are so many of them, the yearly migration is called ‘swarming’. 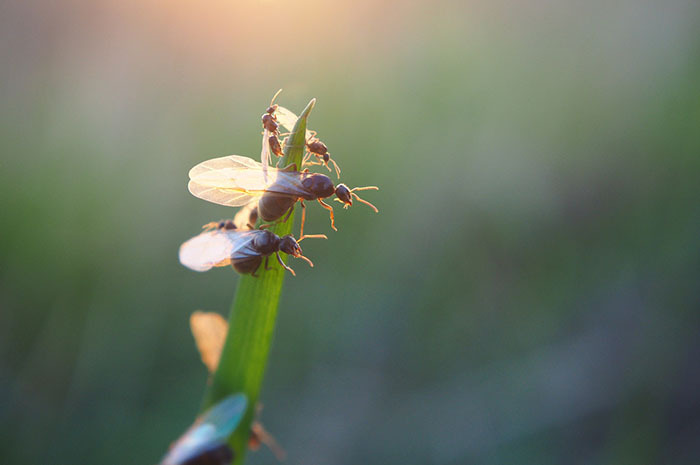 Though swarming has the potential to multiply the danger to your home greatly, it can serve as a red alert for you to call a pest control company, such as Suburban Pest. Flying termites indicate that your home is already infested or soon will be. Without intervention, those new termite ‘families’ will be setting up their dinner table in your house. Millions of these flying termites fly out of each colony as they march unhindered upon your Brisbane, Logan, Gold Coast, or Sunshine Coast home. Tens of thousands of them will land. Of these, about ten per cent will successfully breed and form a new colony. Even if only ten thousand land successfully in search of a mate, that means that you’ll have 100 new colonies positioned around your home. Ignore flying termites at your own peril. Are Flying Termites Drawn to Light? Like moths and other flying insects, flying termites, too, are drawn to light. 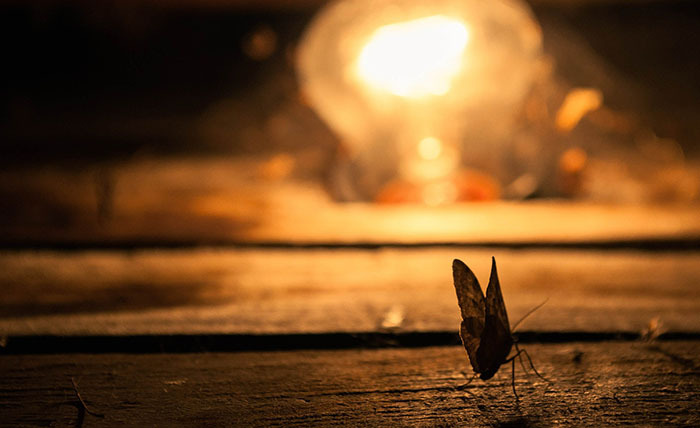 Your porch light, outdoor lighting, and even your indoor lighting act as flying termite magnets—like a neon sign blinking ‘welcome’ to them. Be careful here. Don’t reach for your can of bug spray. Reach for your phone instead and call your Brisbane-area pest control company. Flying termites won’t be deterred by most over-the-counter sprays. After you get off the phone, turn off all your lights in and around your home. The termites will fly out of your home. That, of course, is only a temporary solution. They’ll still swarm; they’ll still breed, and they’ll still invade your home by stealth long after you see them on the fly. The only permanent solution is a treatment by a pest control professional that specialises in termite eradication. Do Flying Termites Eat Wood? It’s not the flyers you have to worry about. When they sprout wings, termites have only one thing on their mind—reproduction. Therein, however, lies the rub. It’s those new colonies they start—and the one they left—that should keep you up at night. Indeed, the old and new colonies do have armies of termites who do eat your wood. In fact, if your home hasn’t been treated, they may be munching on your home’s timber structures as you read this. When you see flying termites, you have a problem brewing underneath your home—not in your living room, dining room, or wherever you see the winged creatures. Ignore this yearly warning at your peril. Call your pest control company and never have to deal with a flying termite again as long as your protection lasts. Keep vigilant, keep up-to-date on your termite protection program, and you can cross flying termites off your worry list. What Attracts Flying Termites to My House? In a word, wood. Even if your home is built from mostly concrete, stone, or brick, you will still have some underlying timber structures. Termites feed on these wooden structures, so it’s well worth your time and money to have regular termite inspections to make sure they’re not invading—and eating--your home. How Do Brisbane Pest Control Professionals Get Rid of Flying Termites? Flying termites—and their offspring are difficult to eradicate. They need a professional’s touch. Save your DIY pest control methods for your resident house mouse or the pesky ants on your patio. Only a termite protection system, be it chemical, physical, or both, can eradicate your home’s infestation and keep them away for good. A Brisbane-area pest control professional can evaluate your home and surrounds to see which type of pest control will work best for your situation. Baits, chemical barriers, and physical barriers are all options. A professional can determine the extent of the infestation and pinpoint treatments that can keep them from becoming a problem in the future. Remember—each of those flying termites represents a colony with a queen that can lay more than thirty thousand eggs every day. How Do I Protect My Home from Flying Termites? If your pest control professional has inspected your home and found it termite-free—congratulations. Now, keep it that way with some easy precautions. Keep your home free from excess moisture: Termites need moisture to survive. The minute you have plumbing problems or other kinds of leaks, have them fixed right away. 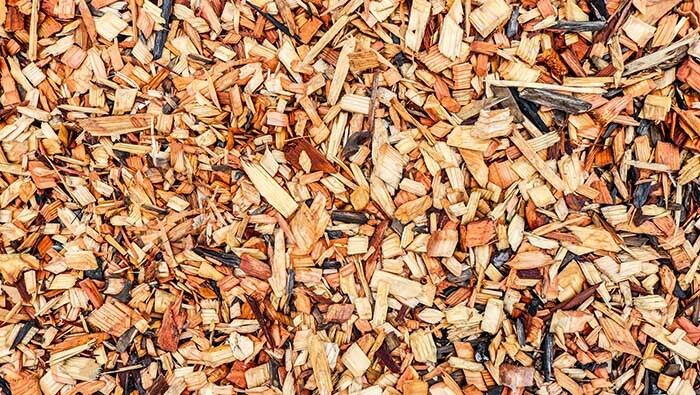 Keep untreated wood and mulch away from your home: Yes, mulch looks nice—but if it’s not treated, it’s a standing invitation for termites—because mulch is just shredded wood. Better to use river rock or other material that doesn’t attract termites to surround your home’s shrubbery. Have an annual termite inspection: Despite all your best intentions and precautions, termites may invade your home. Make sure to get an annual termite inspection. If the pest control company finds evidence that termites are on the move, get your home treated right away. Don’t wait until the termites sprout wings and take to the skies looking to make your home their own. Before you know it, spring will arrive. Make an appointment with Suburban Pest for a termite inspection today. Inspect termites, borers, fungal decay & more + a full written report of all findings and recommendations in accordance with Australian Standard.